Water - to adjust to idli batter consistency. Make sure its not too watery. Oil for frying and greasing the idli moulds. Take a frying pan and dry roast the oats for 3 minutes and allow it to cool.Then grind them to a fine powder. Now add 2 tsp oil to the frying pan, add in mustard seeds, chana dal, urad dal . Once they start sputtering add in the rava/semolina and fry well for few minutes until you get a nice aroma on medium flame. At the end add in the powdered oatsand mix well. Switch off and let the mixture cool down. Add salt to taste , curry leaves and coriander leaves . Now add in the curds and required water to get a thick batter consistency. Lastly add the baking soda and mix well.Allow the batter to stay for 10 minutes. Meanwhile grease the idli moulds with little oil and keep it ready. Add the batter to the moulds and steam in the cooker for 12 to 15 minutes. 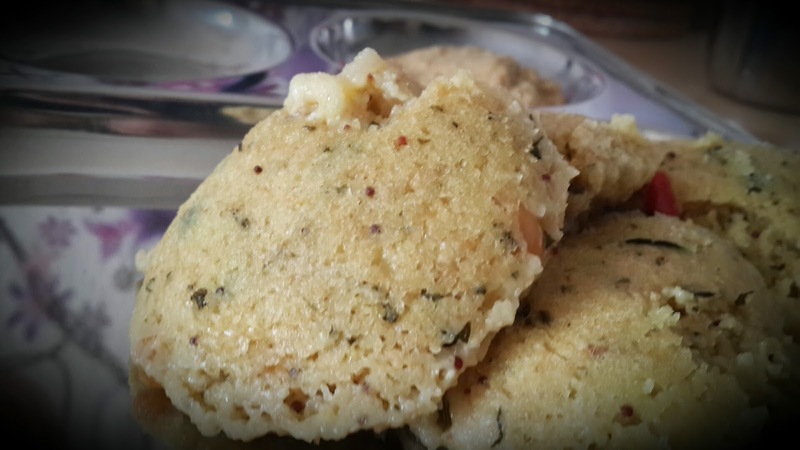 Switch off and enjoy hot hot idlis with chutney!